Microsoft Access 2010 VBA Macro Programming /by Richard Shepherd. Perfect for power users, Microsoft Access 2010 VBA Macro programming reveals how to maximize the features and functionality of Access 2010. You'll get in-depth details on Access VBA Programming and application development followed by 20 real-world projects--complete with source code--that show you how to set up specific subroutines and functions. This practical resource then explains how to include the subroutines in the Access menu system and transform a set of interrelated VBA macros into an Access add-in package. 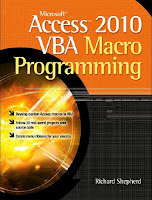 Create your own Access 2010 VBA macros right away with help from this hands-on guide.